Here's an analogy for you; Forex Trading on MT4 is to Trading the FX Market on an Institutional Desk as Driving a sit down Lawnmower is to Driving a Ferrari. The banks already have SOOO many advantages, don't give them anymore help in fleecing your wallet. 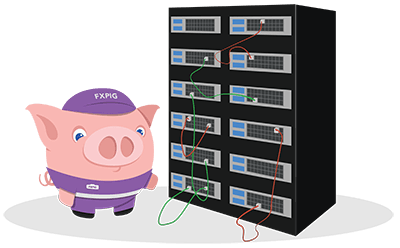 FXPIG™ offers FIX 4.4 access to ALL of it's clients, with NO MINIMUM Volume Requirements and NO MINIMUM Monthly Brokerage Costs. And just to really make this an UNHEARD of deal, you can open a Forex Trading Account with FIX API 4.4 access for the same minimum deposit as MT4... ONLY $500 USD. What is FIX API 4.4 ANYWAY? Think of the FIX API as the connection between you and the liquidity provider actually executing your trades. When you trade via a platform, ie. cTrader or MT4 for example, those platforms need to receive your trade request and convert that request to a FIX Message and then transmit that FIX Message via the FIX API session your broker has established with their connected liquidity providers. In MT4's case this conversion is done via a 'bridge', a plugin that sits on the MT4 server and converts MQL language to something more standard, a FIX API message. When you trade over a direct FIX API connection you bypass the added latency that comes along with using one of these platforms. Still a bit fuzzy on the whole thing? We are here to help. FIX Stands for the Financial Information eXchange and if you like to read stereo instructions their website is chalk full of interesting info. Essentially a FIX API is just a set of protocols or rules that allow you to connect to a FIX host and not only receive incoming market data but also receive and transmit order requests and execution conformation messages. The four point four in FIX API 4.4 is simply the version of the FIX code you are working with. If reading through the FIX website has you a bit confused... try checking out Wikipedia's little write up. It's a condensed version of the same FIX API overview given by the creators of the system itself. why is FXPIG™ the best choice for TRADING FOREX via FIX API? You mean aside from our AWESOME pricing, unbeatable infrastructure, top notch client support, and all these adorable little PIGs? We are straight shooters. PIGs don't lie. We won't tell you that it costs a ton of money or takes a ton of resources to setup a FIX API account. And we won't bill you as if someone needed to run in a hamster wheel all day and night to keep the connection stable either. All this and your choice of liquidity. I mean c'mon guys, what competition are we really talking about here? The table below shows you all the pricing feeds we currently offer via our FIX API, as well as where the liquidity is pricing from, the type of liquidity that is being offered, and the ability of each feed to accommodate toxic flow. The definition of toxic flow can vary from feed to feed and from venue to venue. If you aren't familiar with this terminology, your trade flow is probably not toxic. Last but not least, this table gives you an overview of the securities that are available to trade on each feed. A complete list of the securities offered on our SPA and MPA feeds is available on the RESEARCH page. To download a hard copy of each Feed's Securities List, including the SPA and MPA, simply click on the download icon that corresponds to the feed you are inquiring about. Feel free to download our FIX 4.4 API Protocols for your reference. If you have any questions regarding FIX, the feeds we offer, or any other topic related to our business, FX in general, or if you simply want to chat with a PIG, please get in touch with us today, after all, that is why we are here. So, you ALREADY know PIGs are TRANSPARENT, LOYAL, SMART, DEDICATED, modest, of coarse, and man, with some many liquidity options, why would you trade ANYWHERE else?... From one PIG to another, what are you waiting for?